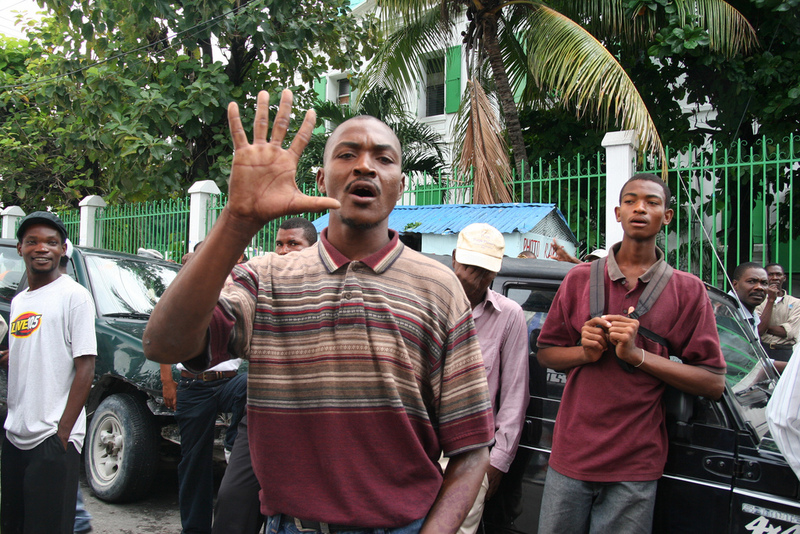 A supporter of ousted President Jean- Bertrand Aristide raises his hand. He's saying Aristide was not permitted to serve the 5-year term to which he was elected. As Haiti’s president-elect Rene Preval takes power, the man who must try to keep order during this transition is considered a reformer and rarely grants access to Western media. Mario Andresol is the recently appointed chief of the Haitian National Police. Andresol has started a purge of the force. At considerable risk, he has arrested dozens of officers he says are involved in drug trafficking, organized kidnapping rings and politically motivated killings. His efforts to clean up the police force have made him a symbol of reform. This entry was posted in NPR, Photography, Radio and tagged Colombia, Corruption, drug trafficking, Haiti, NPR. Bookmark the permalink.